Changes May Be Coming to Lambeau ~ The Bucky Channel - The World of Sports from Wisconsin's Perspective. I've yet to chime in on this whole discussion about whether or not Green Bay could host a Super Bowl, which a lot of people are speculating on after it was declared the 2014 Super Bowl would be in a cold weather stadium (the new home of the Giants/Jets). Quite simply, I think Lambeau Field would be the perfect place to hold a Super Bowl, and I think the NFL isn't opposed to doing it. But it will never happen, mainly because of the hotel/transportation situation. Still, it's fun to dream. 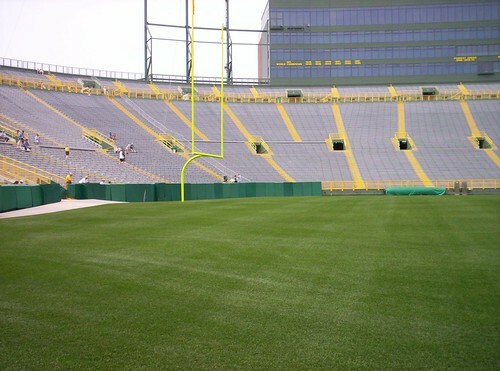 I still did find it curious though that right after all this Super Bowl talk we started hearing about the Packers organization hiring consultants to look at possible improvements to Lambeau Field. Pure coincidence, I'm sure. But what the Packers are looking at doing is renovating the south end zone, which is currently more open than that of the north side. It sounds like in any option the scoreboard would have to be raised, and that they could go ahead and just install new club seats which would increase capacity by up to 8,000 seats. But there are some more interesting scenarios to, as presented by Don Walker of JSOnline, and I wanted to take a look at some of them. 1. A tailgate-theme area, with barbecues, seating in front and picnic tables in the back. Not bad, but I think when you look at making improvements to the actual stadium, you really don't need to corporate the best aspect of being outside the stadium. To me, the whole point of tailgating is getting ready for the game, or even winding down after it. This wouldn't be a bad idea, but I'd prefer to keep the tailgaiting aspect of the Packer game experience away from the actual game. 2. A large seating area, half of it indoor and half of it outdoor (approx. 6,000 seats). This seems to be the most popular option according to the JSOnline poll, and I really can't find any fault in it. It adds a ton of seats, which in turn hopefully moves me up on the season ticket waiting list. You basically just fill in the stadium at this point and go for as many more seats as possible, and again it's not like they'd have a hard time filling those seats. The more the merrier. If any option, I would have to guess that they'd go this route - the safe route. 3. A Bavarian-style brew-pub setting, in which fans would sit at long tables to watch the game. Now this option, I like. They kind of had a set up like this at the Alliant Center in Madison when I went to watch some indoor team called the Mad Dogs like 15 years ago, and if I liked it then I'm sure I'll like it now that I enjoy drinking a large quantity of alcohol in a short period of time. The Bavarian option would incorporate a little bit of the German tradition that is prevalent in this state, and I think the beer hall setting would work quite well in Lambeau. I like it. 4. A play-zone area, featuring pool tables, arcade games and other interactive types of games. This area would have minimal seating, according to the rendering shown to attendees. Laaaaaame. It's going to be a little hard to play a game of billiards when there is two feet of snow in the stadium, and if you really want to play a game of pool don't do it when there is a freaking Packers game being played right in front of you. I never really liked all the interactive, kind of kid-friendly areas in stadiums. I buy a ticket to watch a game, not to see how hard I can throw a fastball. I guess something like this might be alright before the game, but it seems like a waste of space to me. 5. A fully enclosed press box-type setting, in which radio or TV stations could host live events, and fans would sit in traditional seats. One attendee said this concept called for moving the current press box to the south end-zone area, and building the new press box-themed area for fans in the current press box area. The current press box is in the southwest corner of the stadium. Too confusing, and not worth it. Trust me, I've been in the press box, it's lame. Now I'm sure if they opened that area to fans, the whole unwritten rules of watching a game in the press box would be lifted (no cheering, no cheering, absolutely no cheering), but still the press box is not in a good location. It's pretty high up there, and it's not the best view in the stadium. Plus, if you're a member of the press, you want to see the action go left and right, not north and south. It's a bad move for everyone. 6. Another concept would be the creation of a restaurant along the lines of Friday's Front Row Sports Grill at Miller Park. Fans would be able to sit at tables and watch the game at the restaurant. The Packers presumably would contract with a national chain to run the restaurant. This isn't bad. I like the Friday's Front Row setting at Miller Park, but it would seem kind of weird to see something like that in Lambeau. I guess if they combined with a Dave and Busters or something they could kill two birds with one stone and get those pool tables in the there. 7. There was some talk of a rooftop type setting, similar in nature to what fans can do in buildings across the street from Wrigley Field in Chicago. Cubs fans sit in bleachers atop buildings on Waveland and Sheffield avenues. This doesn't make any sense to me. At first I thought they might build actual buildings outside of the stadium, with the sole purpose of wanting to have rooftop seating, but I suppose it would make more sense if they just sort of built it within the stadium there. I don't know, the rooftop thing is something that happened organically, which is why its so awesome down at Wrigley. Plus, that'd be like trying to build another Green Monster sort of set-up, trying to replicate something that's already been done. I say no to this one. Looking at as a whole, I think the regular club seating may be the best bet, but I wouldn't mind them trying to throw something different in there. Again, I really do think the Bavarian style seating would work here, and it'll be interesting to see what the consultants, and other fans that will be asked for their opinion, come up with.